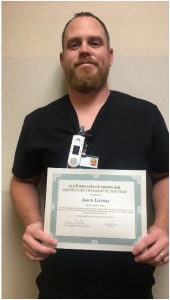 HAYS, Kan. (Nov. 26, 2018) –Jason Livesay, Respiratory Therapist at HaysMed, part of The University of Kansas Health System, was recently named Respiratory Therapist of the Year. Respiratory Services awards an annual Breath of Fresh Air award to recognize a respiratory therapist for their hard work and dedication. The award winner is nominated and chosen by their peers and highlights an Associate in the respiratory therapy department who positively contributed the most teamwork and patient care during the year.